As Nogbad the Bad's crows circle high over the land, they behold a strange site. Below them they see a strange grey monster in a coat of jewels being ridden towards Noggin's castle. As the monster arrives at the castle, the Nogs demand to know what it is of its rider, who tells them it is a present for Prince Knut from the King of the Southland. The rider presents the monster to the prince and wishes him a happy birthday. Noggin thanks the visitor for his son's gift, but asks him why the monster looks sad. The rider can only suggest that as the animal is young, perhaps he is missing his mother. One of Nogbad's crows overhears the conversation, and returns to his master to tell him what he has seen. 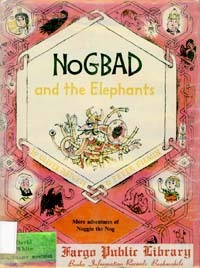 Intrigued, Nogbad looks through a book about animals, and soon realises that the monster must be an elephant. He decides he is going to steal the jewelled coat that the elephant wears. Knut plays heartily with his new pet, but despite his games, the elephant remains sad. In an attempt to cheer it up, they build it a large bonfire and, covered with blankets, the tired elephant falls asleep, still sad. After a while, the concerned Nogs hear a noise like a trumpet. The elephant also hears the noise and wakes up. The castle gates the burst open, and Noggin's soldiers run in, and tell how a great monster, like Knut's pet but much bigger, is heading for the castle. As the monster approaches and the ground shakes, the Nogs hide in fear, but the baby elephant smiles. A huge, grey elephant then enters the castle gate with much clanking, rattling and trumpeting, to the joy of the baby elephant who holds the tale of the big elephant with his trunk as the two animals leave. The Nogs, glad to see the baby monster happy, watch the elephants head off. The baby elephant joyfully follows the other as it leads him along the path by the river that leads to Nogbad's castle. Excited, the baby runs down to the water and starts to play in it. Wanting the big elephant to join him, he takes it by the trunk and pulls and pulls. All of a sudden, the large elephant splits in half, to reveal Nogbad the Bad sat inside a wooden frame. Very angry, the baby elephant blasts Nogbad with water and chases him. When he catches him, he carries him back to Noggin, who has him cast into prison. The elephant is now very, very sad. Knut realises that the baby is missing its mother, so after Nooka has knitted it some woolly socks and a thick coat, the elephant and Knut depart on a long trip for the Southland. Also included in "Three Tales of Noggin (Volume 2)"